Nothing Could Go Wrong When Off-Roading A McLaren 570GT, Right? The camper vans of sports cars (so these guys say). Anytime we auto scribes are driving a car that doesn’t belong to us, we tend to be careful. Automakers, and sometimes dealerships, graciously loan us their latest cars and trucks in order to provide you, our loyal readership, quality and informative reviews. We don’t do stupid stuff because, mainly, we don’t want to be held liable for any possible damages. But these guys have a different mentality. Mike Tornabene and his pal Zac of gnarpm.com managed to convince McLaren of Beverly Hills to loan them a pair of brand-new 570GTs. They didn’t plan to do the typical road test. Instead, they went off-roading in vehicles that have a combined total value of around half a million dollars. And yes, the dealership made clear to them beforehand they’re liable for everything (and something always goes wrong). But they opted to go camping anyway. To reach their campsite in Lone Pine, California, they had to drive seven miles off-road. It’s not the most treacherous of off-roading conditions, but let’s just say most McLaren owners would never, ever, consider doing something like this. With its twin-turbo V8 producing 562 hp and 443 lb-ft of torque, the 570GT definitely has the power to fight its way through some dirt, but how much can a high-performance sports car whose main competitor is the Porsche 911 Turbo really handle? 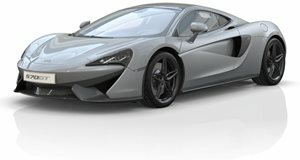 Without the use of 4WD or AWD, there’s only so much that can be done in the dirt in a McLaren. But let’s just say you’ll be surprised by just how much of a beating the McLarens are able to take – and how much camping gear can be packed inside.